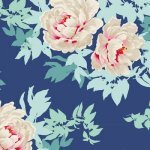 Sunkiss Beach Peony Blue by Tilda TIL100026. 42 inch wide. 100% Premium Cotton. The Sunkiss Collection is inspired by bright turquoise water, beautiful fowers, colorful corals and anemones waving with the current as you break through the water?s surface. 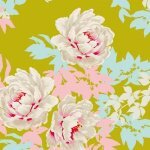 Sunkiss Beach Peony Lime by Tilda TIL100028. 42 inch wide. 100% Premium Cotton. The Sunkiss Collection is inspired by bright turquoise water, beautiful flowers, colorful corals and anemones waving with the current as you break through the water?s surface. 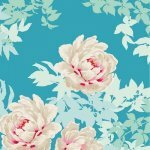 Sunkiss Beach Peony Teal by Tilda TIL100025. 42 inch wide. 100% Premium Cotton. The Sunkiss Collection is inspired by bright turquoise water, beautiful fowers, colorful corals and anemones waving with the current as you break through the water?s surface. 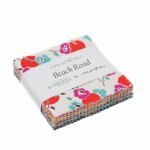 Beach Road Mini Charm by Jen Kingwell for Moda 18132MC. On Sale Now. 42 squares 2-1/2" x 2-1/2". 100% Premium Cotton. 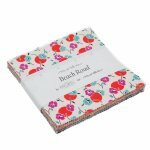 After relocating Amitie Textiles to sunny new surroundings in Torquay, Beach Road marks a turning point for me in my creative endeavors. Sand Beach Quilt Pattern by Atkinson Designs ATK-192. On Sale Now. 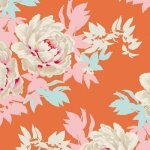 Jelly Roll friendly quilt in 4 sizes from lap to king.